Discarding the mattress is another option, although a new mattress will quickly become infested if bed bugs are still on the premises. Steam cleaning of mattresses is generally not recommended because it is nearly impossible to get enough heat into the middle of the mattress. Also, the excess moisture can lead to problems with mildew, mold and house dust mites, etc. 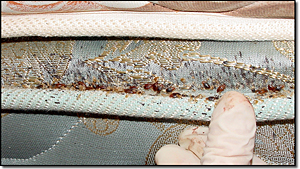 In dealing with an infested sofa, love seat or upholstered chair, disposal may be necessary since it is difficult to get treatment into the deepest crevices of the furniture where the wood frame may provide harborage for bedbugs. In cases where the population of bedbugs is high, treatment of adjacent rooms is necessary. Closets in bedrooms may require treatment and the contents will need to be washed and dried as needed. Repair cracks in plaster and glue down loosened wallpaper to eliminate bed bug harborage sites. Remove and destroy wild animal roosts and nests when possible.